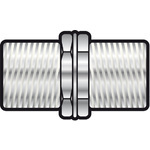 A high quality black nickel twist on F connector specifically designed for thicker 'CAI approved' downleads. 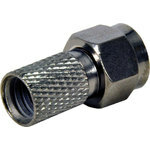 High quality black nickel screw on F connector, specifically designed for RG6 cables. 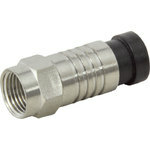 Snap seal F connector available in nickel and black finish. 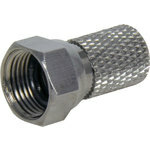 Watertight seal when used with 'CAI approved' type foam cables. 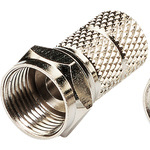 Twist on F type plug for RG58 5mm cable. 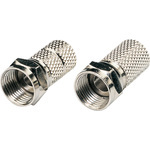 Twist on F-type plug for RG6 and 100 type (6.5mm to 7mm) cable.